Austin, TX, – Honor Flight Austin’s 19th Honor Flight to Washington D.C.; will have thirty-four Veterans on board. One of those WWII Veterans is former Army Captain Rachel “Rae” Clark, age 94, having served in the Army as a Surgical Nurse. Ms. Clark will reunite with her longtime friend and WWII comrade, Maclovia Cribbs, age 91, who resides in Washington D.C. In 1944, Rachel Clark was sent to Paris, France where she met fellow surgical nurse, Maclovia Cribbs. The two will reunite at the World War II Memorial, September 27, 2014 at 10:00AM for a special ceremony honoring all the WWII Veterans in attendance. The public is encouraged to attend. Maclovia Cribbs, originally from the Rio Grande Valley of Texas, served in the United States Army and Air Force. Ms. Cribbs was stationed in a hospital outside of a darkened Paris. Ms. Cribbs was standing along the Champs-Elysees during the historic moment when the lights came on at the Arc de Triomphe, symbolizing the end of the war in Europe. Honor Flight Austin is a not-for-profit, volunteer-run charity organization that flies World War II Veterans to see the memorial in Washington, D.C. This two-day trip is a way of saying thank you to all who served. The World War II Memorial was dedicated in 2004 – 59 years after the war ended, honoring the 16 million who served in the armed forces of the United States, and the more than 400,000 who died. Our mission is to fly our World War II Veterans free of charge to visit those memorials dedicated to honor their sacrifices. Statistics indicate we are losing these heroes at a rate of approximately 640 a day. The Honor Flight Austin mission is to transport veterans with a specific priority given to those residing within 14 counties listed below to Washington, D.C. to visit those memorials dedicated to honor their service and sacrifices and return them home to their families and loved ones. 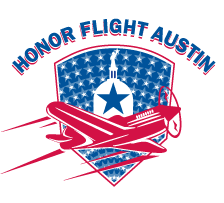 Honor Flight serves the following counties: Bastrop, Bell, Blanco, Burnet, Caldwell, Fayette, Gillespie, Gonzales, Hays, Lee, Llano, Milam, Travis, and Williamson Counties.